watch Tonight I was shocked to discover that I have not posted my biggest “go to” and one of my all time favorite recipes ever! The discovery occurred when I had about twenty good friends over to support another good friend in her new business venture. You see, my friend Ronnie, is a fashion consultant and I hosted a home party for her tonight. I served my Caesar Dip, which I have been making and serving at parties for the past two decades. 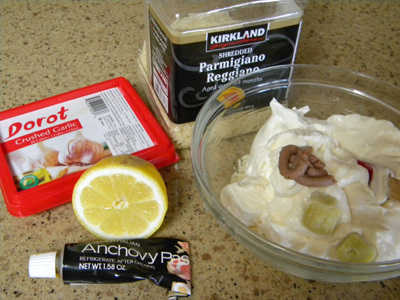 Just ask any one of the employees at my husband’s office and they will tell you that they have had Caesar Dip. We hosted the office Christmas Party for about 10 years running and it was there on the buffet year after year. So when a bunch of the ladies tonight were asking for the recipe, I was telling them to look here on the blog. One of them said they didn’t think is was posted – lo and behold, she was right! Honestly, I would have thought that it would have been one of, if not, the very first recipe I would have put up. My favorite crudités to serve with the dip and the ones I think compliment it the best are Belgian endive spears, cherry tomatoes, and new or fingerling potatoes. For the potatoes, just boil in salted water until they are easily pierced with a paring knife, drain and while still wet, toss in Kosher or sea salt. Assorted crudités; such as cherry or pear tomatoes, endive spears, boiled and salted new potatoes, sugar snap peas, cucumber slices, carrot and jicama sticks. Mix all ingredients in medium bowl. Season with freshly ground black pepper, to taste. Caesar dip is best when make at least 3 hours and up to 1 day ahead, cover and refrigerate until ready to serve. What about EASY-BREEZY that doesnt explain that mother! What is there to explain Connor, people want Easy Breezy – you should know that! And all of them can’t have bacon, sorry! This recipe is always a winner. I have made it often. One of my faves too! 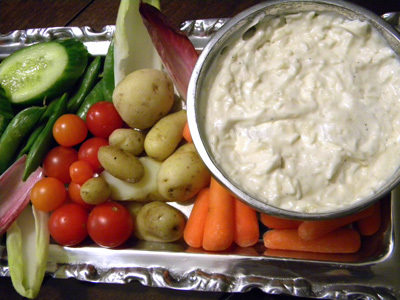 Great dip… and love the idea of using potatoes as Crudites..
never before seen around Memphis!